Anyone interested in an opportunity to get in front of some of the top working choreographers in the country? Look no further than LAUNCH a program initiated by Northwest Dance Project in 2004 that has now gained international attention. With nearly 200 auditioners for 40 spots, there is certainly a competitive edge, but once accepted, the program is all about fostering the growth, professional development and personal voice of each dancer. Many dancers early in their careers don’t know the inner workings of a professional company. Throughout the LAUNCH two week intensive, topics discussed range from the do’s and don’ts of resumes to the day-to-day expectations of a professional dancer. Not only is it an opportunity for dancers to be thrown into the pot of intense training and creating, it’s also an opportunity for the selection of guest choreographers to see how they work. Out in the “real world” a short audition can never reveal the whole picture of what a dancer has to offer and many choreographers have plucked participants directly from the program having liked what they saw. LAUNCH is the program Northwest Dance Project was initially known for, but certainly not the last. On April 2nd, 2014 a Mayoral Proclamation was made both to recognize and celebrate the accomplishments of Northwest Dance Project over the past decade. Days later their 10th anniversary show “Directors Choice” opened and they projected it live on the JIVE building downtown for all of Portland to enjoy. Executive Director Scott Lewis told us, “We are never done exposing ourselves to the community” and we hope it’s true because we want to see, learn, and experience more! For anyone out there even slightly intimidated by watching dance, stop what you’re doing and watch a few of BodyVox’s dance for film creations. For years Artistic Directors Jamey Hampton and Ashley Roland have been collaborating with film maker Mitchell Rose to create a delightful collection of pieces you may not have seen anything like. Dance is so foreign to so many people but Jamey and Ashley want to let everyone in. They believe that film opens the door for a lot of audiences to understanding dance. When watching a live performance in a theatre setting, many people don’t know what to do – if it’s okay to laugh, react, make a noise – but with film people are more familiar. It also helps that BodyVox excels at levity. From a touching love affair between a man and a tractor, to fantasies of a more exciting office environment, they prove that movement is a language and we all speak it to some degree or another whether we know it or not. These films have gone viral on YouTube, one awards at film festivals and appeared on French television as well as the Cartoon Network. While this is just one aspect of the amazing work BodyVox offers we are proud that whether touring, filming, educating or otherwise spreading their reach across the globe, their home is in Portland, Oregon. AWOL is a performing company and training facility that over the past 10 years has become a staple of the Portland aerial dance scene. Every August they put on a magical show called Art in the Dark. With stars shining above and a theatrically lit canopy of trees, it is an outdoor adventure and a quintessential experience that truly represents the values of the Northwest. 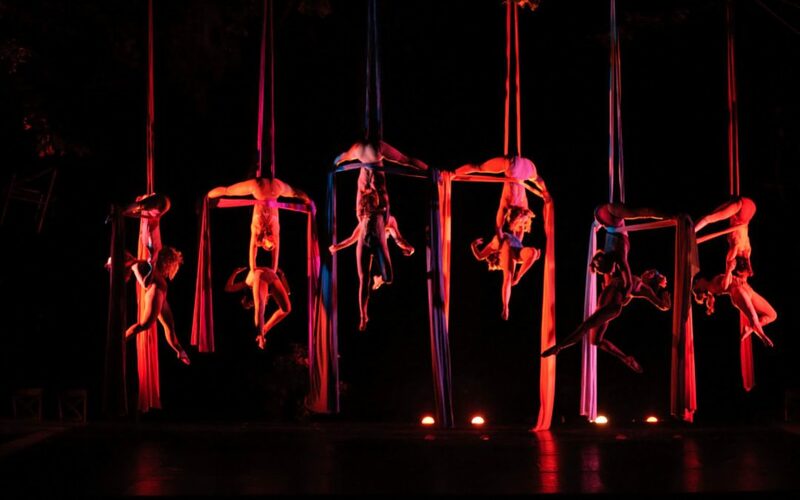 While Art in the Dark has a unique theme each year, you can always expect to see a full company of aerialists doing tricks on a variety of apparatus (some traditional, some invented) and often times accompanied by live music. The seating wraps around four stages which adds yet another dimension to the work. This year will be the company’s 10th year doing Art in the Dark and the company has extended the show over two weekends to accommodate the sold out crowds of the past few years. If you are a local, let it become an annual tradition, if you are a visitor, this is a perfectly unforgettable Portland experience!